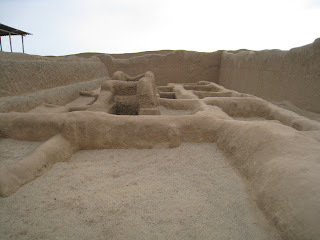 We went to Trujillo and saw the slowly melting remnants of what once was the worlds biggest Adobe city. Over a hundred thousand people lived here at the site of Chan Chan before the rise of the Incas and all were gone by the time Columbus discovered the americas. It´s kind of mind-boggling. 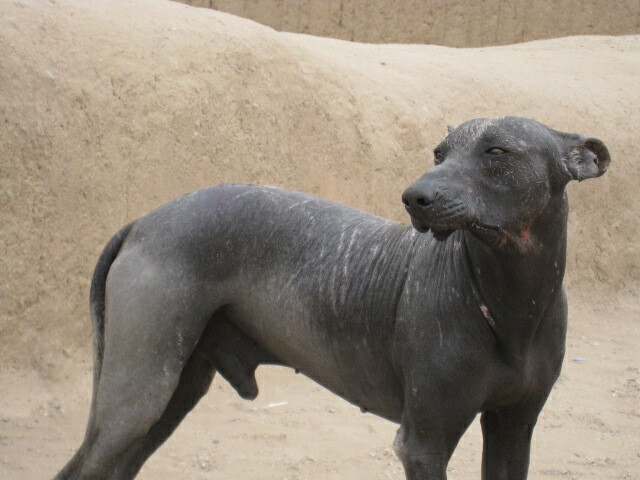 Additionally, there are these Incan dogs that have no fur and are black. A remnant of this breed was playing the waiting game for snacks outside the Chan Chan concession and we had to take some photos home. Don´t you want one of these guys for a pet? 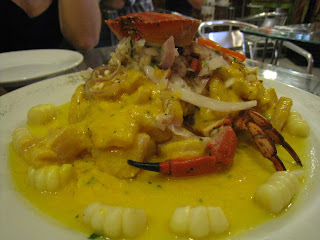 We have left Lima for a few days after eating some amazing ceviche. Lunch is the big meal of the day here and ceviche and pisco sours are the name of the game at this busy local place on a hectic Friday afternoon. The band was in full swing when we arrived at 3 o-clock and we wasted no time getting the ceviche of the day. Yes, it comes with it´s own small crab. 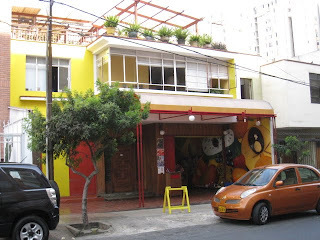 We also discovered people lined up at this place in Miraflores that makes amazing cremoladas and has these cookies called alfajores that are basically amazing velvety shortbread with caramel in between - yummer-do!. 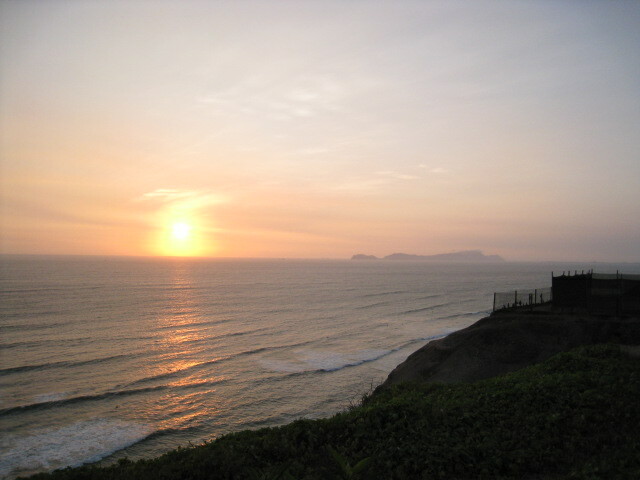 Here´s the sunset of Miraflores where people make-out and make-up. Also a lot of people like to para glide here. All in all I can say that Lima is a great city to get to know. It´s pretty hectic and crazy at times and in places, but it has many faces and the food is amazing. There is street food a plenty as well. 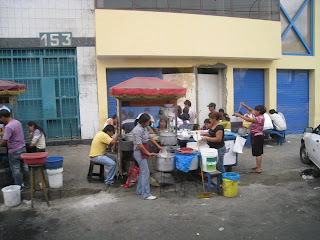 This collection of comedors next to our bus station in the centro had hot herb drinks and chicken with chicken and chicken and rice. 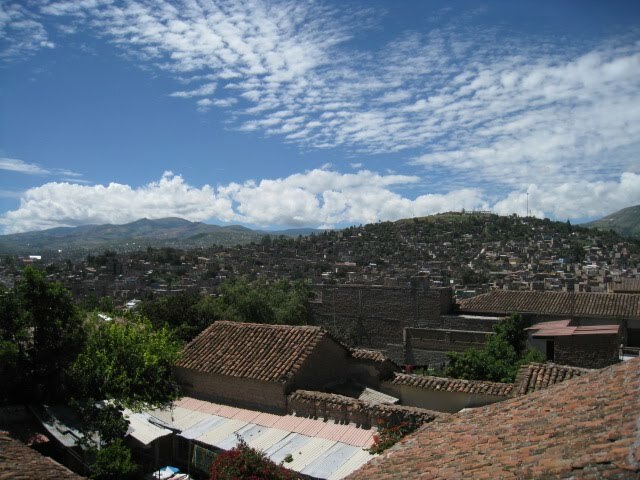 Another 9 hour bus ride down the desert coast and up through some amazing countryside has brought us to the quaint little city of Ayacucho. 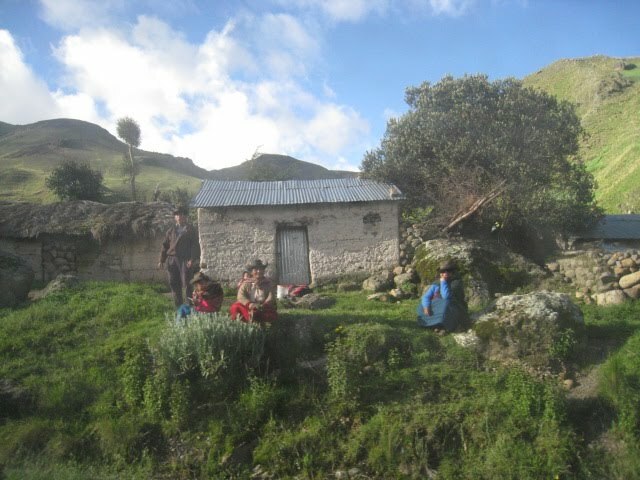 We thought it might be a better idea to visit this place as Cusco is completely swamped in rain these days and we seem to be getting lucky with the weather so far. 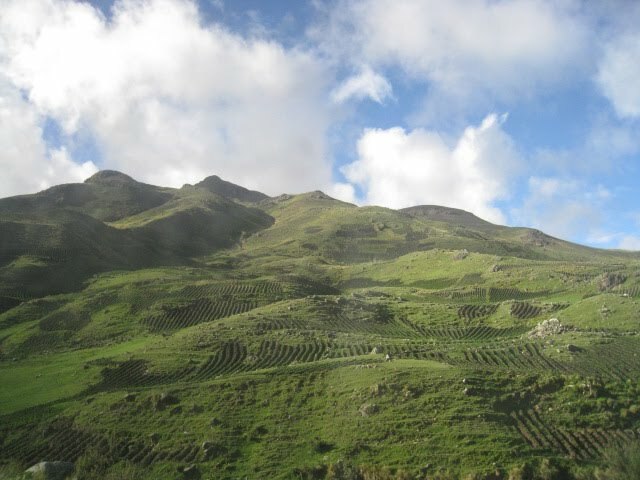 The ride up here on the bus was by far one of the most amazing drives I have ever been on. At first you climb up and up through giant mountains with hard and dry cliffs to high plains dotted with herds of Alpaca and sheep. Then we descended slightly through some of the most amazing terrain. 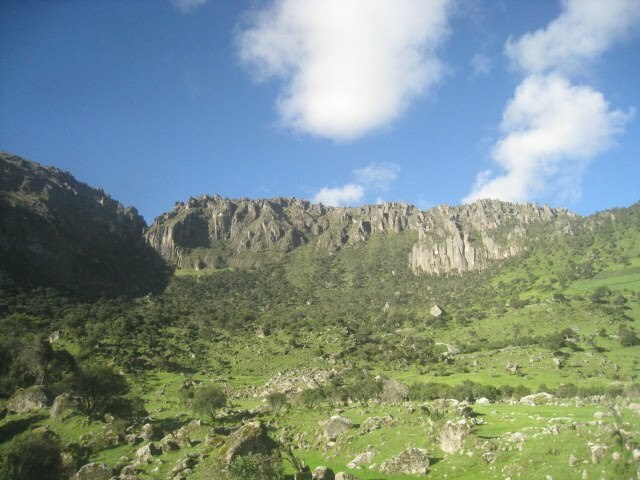 High walls of rock jut out of the valley with sharp and smooth angles like massive folding screens. 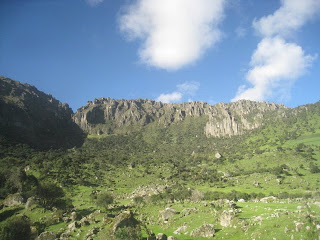 The valley floor was riddled with boulders of various sizes, sparkling little rivers and ultra green grass. It was very surreal. My bus window shots do not do it justice. Ayacucho is a nice town of around 170 thousand people and has a quiet industriousness to it. 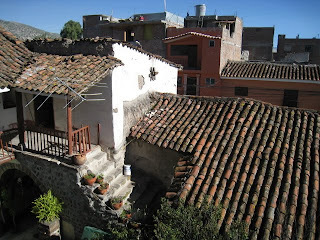 There are a lot of churches and small artisan shops that sell ceramics and weavings of high quality. 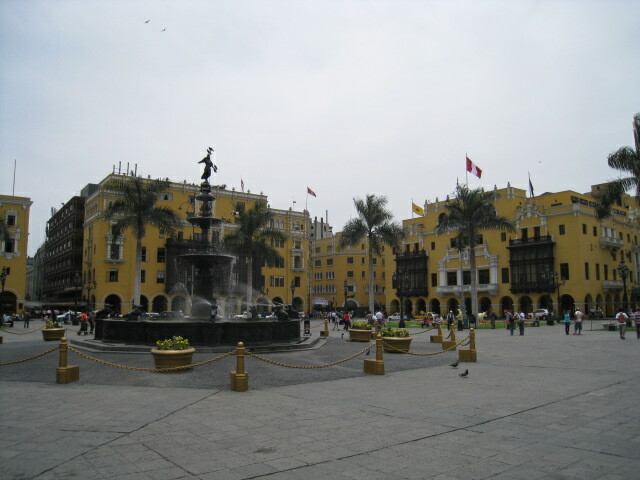 The main square is pleasant and people here are pretty outgoing and seem to like their city. 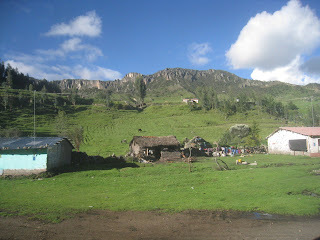 Our guidebook calls this part of Peru, ¨the heart of Peru¨ and I can get a small idea of what they are talking about. Here is a shot of our little hostel that we are staying at. Mostly it´s just nice to be somewhere where the pace is a little more laid back and you can relax back and have one of these to help quash the high altitude headaches and give you extra energy for the day ahead. 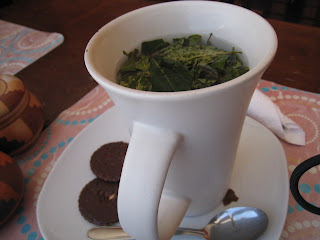 Cocoa leaf tea! Well having said that I am feeling a moist breeze on my arm and can see outside the open door of this internet cafe that there is a nasty storm boiling off in the distance. Maybe I spoke too soon. I will post again homies! Hope all is well where you are. We are finally in Cusco. - no kidding this time. We go the high-way but not the highway.